Anyone who has followed national politics over the last year will be eagerly awaiting the results of the efforts in Wisconsin to recall Republican Governor Scott Walker. It is considered to be the most important pre-November general election result in the country because it represents two distinct philosophies and the direction this country could go when all the votes are tallied on November 6th. But more importantly, it is a bellwether election, a test strategy for Democrats to see just how competitive a superior ground game can be, and whether or not underfunded Democratic candidates across the country can compete with the hundreds of millions of dollars Republicans and Republican affiliated organizations (read Super PACs) are going to dump into efforts to once again wrest total control of the government from Democratic hands. 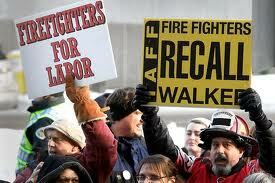 There are reports out of Wisconsin that Scott Walker’s forces have outspent the Democrats upwards of 20 to 1. More realistic figures peg that ratio at better than 7 to 1. As our own Shane Finneran reports from Wisconsin (where he is currently visiting relatives), the airwaves are saturated with political ads, mostly in support of Walker and the five other Republicans that are subject to the recall (four State Senators and the Lieutenant Governor). The Koch driven Americans for Prosperity has embarked on a statewide “A Better Wisconsin” bus tour to tout the “successes” that Walker’s agenda has brought to Wisconsin.